Delhi University has submitted to the Delhi High Court that the Bar Council of India has allowed the enrolment of students who have passed out till 2013-14 as advocates. Mohinder J S Rupal, appearing for the University also submitted to the Bench of Chief Justice G Rohini and Justice RS Endlaw that the University has also been issued show cause notices during the inspection made by BCI. 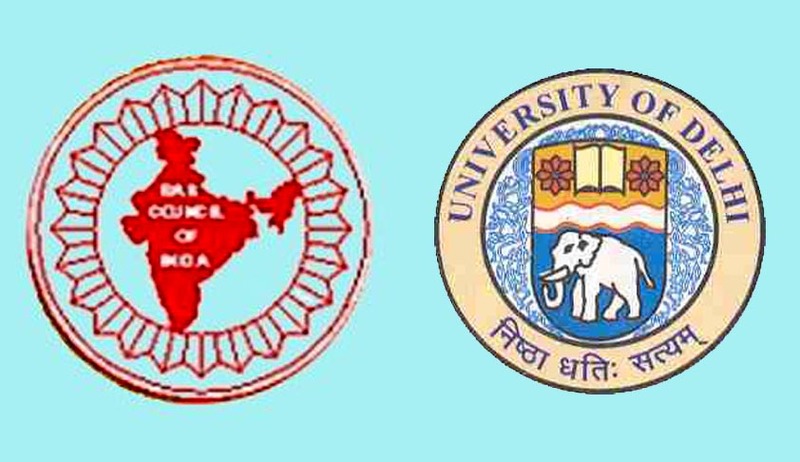 The Court then reportedly said, "It is brought to our notice by MohinderJSRupal, the counsel appearing for the University of Delhi that the Bar Council of India, on the basis of the report submitted by the inspection team, passed an order on January 12, 2015 recommending approval of affiliation till the Session 2014-15.It is also stated that show cause notices have been issued to the Vice Chancellor, all the heads, Deans and three professors In-charge of all the three law centres of Delhi University calling upon them to submit their reply within eight weeks to the adverse remarks in the inspection report." It added, "Under the circumstances, we deem it appropriate to adjourn the matter by eight weeks." Earlier, the law course taught by Delhi University was derecognized by BCI and the pass outs became ineligible for enrolment. Subsequently, an inspection of Law Centres within Delhi University was made by BCI, and the course has now been cleared. The Law Centres are also to shift from the present 90-year-old building they are present. PIls were also filed against de-recognition of the course by BCI. The petitions had claimed that the decision of BCI was arbitrary and violative of fundamental rights. It had reportedly said, “BCI has revoked the approval of affiliation only on the ground that Law Centres, University of Delhi, did not comply with the order issued by it." The petitioners had prayed for a direction to the BCI as well as a compensation of Rs, 5 lacs to each law graduate from Delhi University whose enrolment was illegally denied by BCI. The matter will come up on April 6.